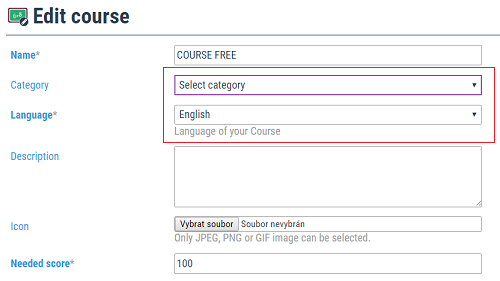 When creating the course you intend to publish in your course eShop, you may help your potential customers find the courses easier by using the search parameters such as Course category or Language of the course. 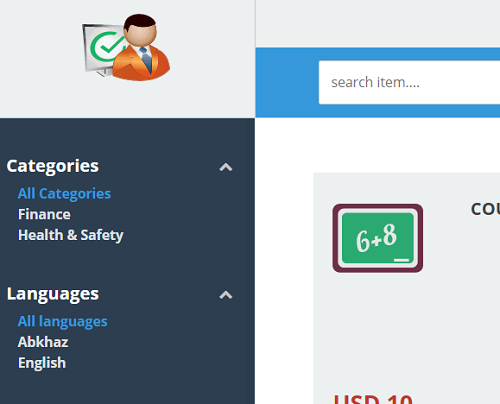 The customer may use those predefined filters to see all courses offered in respective Category or Language. He may also use the full text search combined with the predefined filter together. We have uploaded the most common categories of the education, businesses and human life to our best opinion and we expect that you should fit with some of those categories. In case you feel, there is some important missing, let us know via development request and we consider to add into the list. Category may include also subcategories. There is a full set of worldwide languages, you may select your preferred. The language indicates the course / lessons content language not the language of the elearning system.